(1) In December 1991, the Government of Japan started a fact-finding study on the issue of "comfort women." 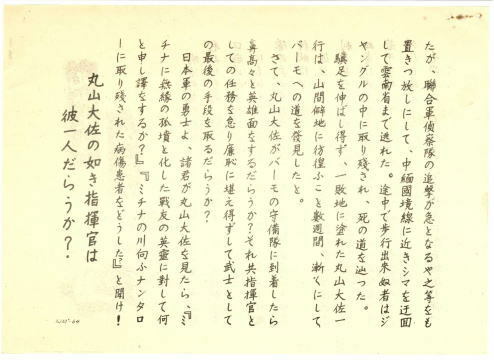 (2) The Government of Japan investigated whether or not the materials on this issue are kept in ministries and government offices of Japan, the National Diet Library, and the U.S. National Archives, and made thorough examination of more than 230 relevant materials found through the investigation. At the same time, the Government of Japan, dispatching missions at home and abroad, conducted a wide rage of hearing investigation from former "comfort women", former military personnel, ex-officials of the Government-General of Korea, former operators of "comfort stations," residents of the area where "comfort stations" were located, historians, etc. Furthermore, the Government studied not only the study report compiled by the Government of the Republic of Korea, collections of testimonies by former "comfort women," which were compiled by the related organizations including the Association of Pacific War Victims and Bereaved Families and the Korean Council for the Women Drafted for Sexual Slavery by Japan, but also numerous publications related to this issue. (3) The Government of Japan examined and analyzed the materials and testimonies collected through this study, and announced the result on August 4, 1993 (See ANNEX I). The main Points of the result are as follows. *"Comfort stations" were established and operated at the request of the Japanese military authorities of the day. *The then Japanese military was, directly or indirectly, involved in the establishment and management of the "comfort stations" as well as the transfer of "comfort women." *The recruitment of "comfort women" was conducted mainly by private recruiters who acted at the request of the military. However, in many cases they were recruited against their own will, through such means as coaxing and coercion, and at times administrative / military personnel directly took part in the recruitment. (4) This finding are based on the study which the Government conducted with utmost and wholehearted efforts. However, there still is a possibility of new materials to be found, and the Government of Japan has paid a close attention to the possibility, following private studies on this issue as well. ....conducted a wide rage of hearing investigation from former "comfort women", former military personnel, ex-officials of the Government-General of Korea, former operators of "comfort stations," residents of the area where "comfort stations" were located, historians, etc. The Special Rapporteur's legal arguments, which the Government of Japan carefully studied, are not well founded in international law. The Government of Japan has seriously reservation on major parts of her legal arguments. 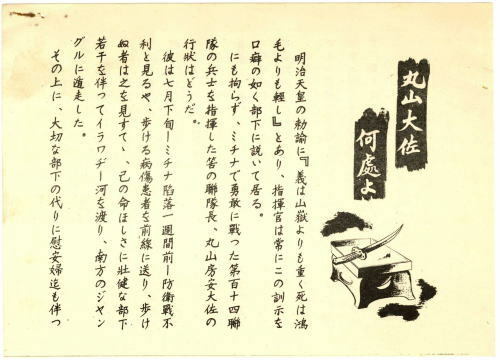 As regards the issues of reparations and/or settlement of claims for the damage and suffering caused during the war, including the issue of "comfort women," Japan has sincerely fulfilled its obligations according to the San Francisco Peace Treaty, bilateral treaties and other relevant international agreements, and therefore, the issues have been finally and completely settled between Japan and the Parties to the above mentioned agreements. As for the obligation to pay compensation to individuals, it is the established rule that an individual cannot be a subject of rights or duties in international law unless his or her right is expressly provided in a treaty and the procedure for exercising the right is guaranteed under international law as well. Despite the Special Rapporteur's quotations, instruments such as the Universal Declaration of Human Rights, and the International Covenants on Human Rights have nothing to do with an individual's right to claim compensation under international law. 1965年深津文雄牧師は,社会から見捨てられた女性たちが一生暮らせる婦人保護施設「かにた婦人の村」を設立した. 1984年,一人の寮生が自らの従軍慰安婦体験を牧師に告白する. この告白(「石の叫び」)を受けて,施設内にある小高い丘にヒノキの柱を立てたのは1985年であった. 翌年そこには「噫 従軍慰安婦」と刻まれた石碑が建立された. 「深津先生へ…軍隊がいるところには慰安所がありました. 看護婦とみまがう特殊看護婦になると将校相手の慰安婦になるのです. 兵卒用の慰安婦は一回の関係で50銭,また1円の切符を持って列をつくっています. 私たち慰安婦は死の影とともに横たわっていました. 私たちは洗うひまもなく,相手をさせられ,死ぬ苦しみ. なんど兵隊の首を切ってしまいたいと思ったかしれません. 半狂乱でした. …戦争が終って40年にもなるというのに,戦死した兵隊さんや民間の人のことは各地で弔われるけれど,戦争で引っ張られていった慰安婦に対する声はひとつも聞えてきません. 中国・東南アジア・南洋群島・アリョーシャン列島で,性的欲望のため体を提供させられた娘たちは,死ねばジャングルの穴に捨てられ,親元に知らせるすべもない有様です. 途中で足手まといになった女はほっぽりだされ,荒野をさまよい凍てつく山野で食もなく,野犬か狼のエサになり骨はさらされた土になり,粉々に砕けた手足は陣地の表示板になりました. それを私は見たのです. この目で,女の地獄を…. 歴史の事実の学びについては,「慰安婦」問題など存在しないという,そういう角度からの見解も正面から時間をかけて検討するようにしています. 現在のマスコミや教育の状況のもとでは,学生たちに対して「つくる会」のような歴史観は,いつでも一定の影響力をもっています. そのときに,「日本政府は謝罪すべきだ」という立場からの文献ばかりを読んでも,じつは問題は解決しません. 「先生はそういうけど,本当のところはどうだったんだろう」. そういう疑問がずっと残ってしまうのです. テル・劉仁夫妻の長女. 0歳のとき両親が病死. 中国・ハルピンの孤児院などを転々として育ち,文化大革命など中国の現代史を生き抜きます. 1979年初来日. 現在帰化し,京都在住. 同志社大学講師を務めます. 当時の苦難について,暁子さんはこれまで多くを語ろうとはしませんでした. それどころか,母親・テルについて語ることにも抵抗があったようです. 「母は母,自分は自分」という思いが強かったのです. そんな暁子さんが,今やっと心を開くようになってきています. 中国での暮らし,そして母への思いを素直に吐露するようになってきたのです.